The Drummer's World Cup: popular. 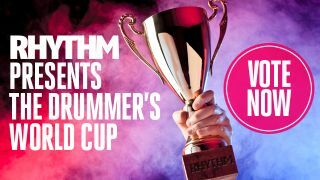 2012 has been a great sporting year, and our friends at Rhythm magazine kept us on the edge of our seats with their fiercely contest Drummer's World Cup. We also rounded-up the very best hi-tech and guitar gear of 2012 and heard from Michael Schenker and Jack Douglas. Drummer's World Cup Winner Crowned! See who's been voted Champion!